Note: I grilled the dough on one side for four minutes, flipped and dressed the pizza, then grilled for about six minutes. The fresh toppings came from The Good Food Collective and our garden. Cilantro is not an ingredient I commonly use but it was delicious with the other ingredients. Baby carrots…baby corn…baby zucchini…baby spinach. Can you guess the theme to this week’s pizza? I tossed baby carrots, baby corn, and baby zucchini in garlic and herb basting oil then roasted them in the toaster oven for 20 minutes. After pre-baking the dough I spread on homemade pizza sauce, sprinkled on mozzarella cheese, added baby spinach and the roasted baby vegetables. I baked the pizza for 8 minutes at 500 degrees. Every Autumn my mom makes an amazing butternut squash lasagna. I have wanted to use the key ingredients from her recipe for a pizza since the beginning of my pizza project, so when a butternut squash was included in our share from The Good Food Collective I jumped at the opportunity. I diced the butternut squash, sprayed it with canola oil, added some salt and pepper, then roasted it in the oven until it softened a bit. For a base to the pizza, I blended ricotta cheese with pesto sauce, then spread that on the pre-baked dough. I added the squash and sauteed onions and then let it bake. This pizza was a great idea; it was so delicious! The roasted squash had a sweet flavor that complimented the pesto cheese spread very well. 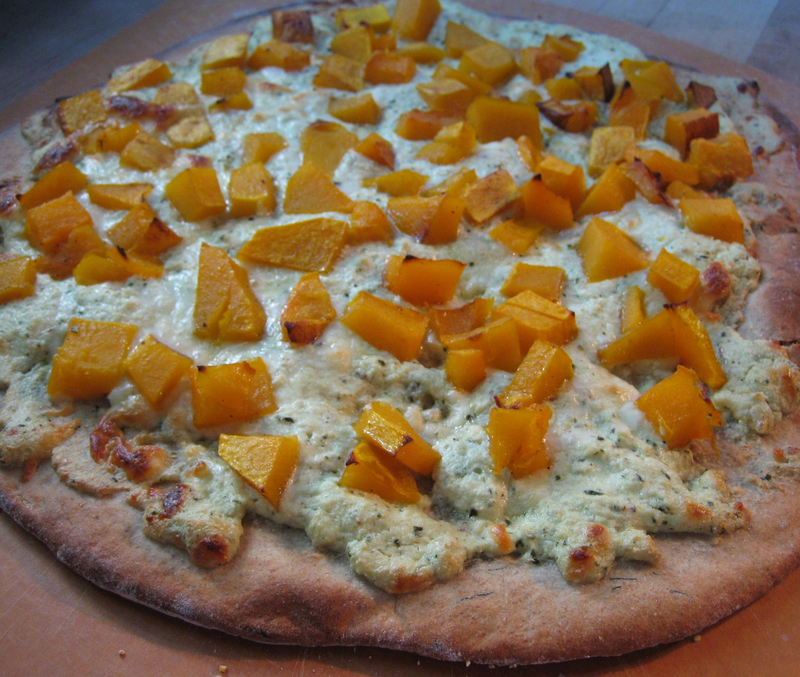 My butternut squash pizza was a great kick-off to the fall pizza season! For some reason I was in the mood for lasagna earlier today so I bought the ingredients to make a summertime lasagna. I thought this would be a nice dish to prepare for RJ, one of Andrew’s former students/flag football teammates, but at the last minute I remembered a pizza adventure I had been wanting to try. I have made over 100 unique pizzas, but somehow I have never made a pizza with ricotta cheese. Tonight would be the night. In addition to the ricotta cheese I had also picked up Italian sausage at the store. We had an abundance of yellow squash and a nice bunch of basil from our CSA, The Good Food Collective. To begin, I sliced one yellow squash and white onion and then sauteed them. I also browned the sausage in a pan. While that all cooked I used a blender to combine ricotta cheese, fresh garlic and basil. It smelled and looked pretty similar to a pesto sauce. After pre-baking the dough I spread on the cheese mixture, then topped it with the Italian sausage, yellow squash and onions. I then let it bake for about 10 minutes. I always enjoy having guests over on nights I am making a new creation so that if it is a good pizza they can enjoy in the experience with us. Well this pizza was a winner! The ricotta cheese mixture tasted fantastic with the flavors of the fresh squash and the Italian sausage. The flavors were rich but that didn’t stop us from eating most of the pizza. Another thing I like about having guests over for new pizza creations is giving them the the honor, or the pressure, of naming the new pizza. When given the reigns RJ quickly settled on The Healthy Italian. 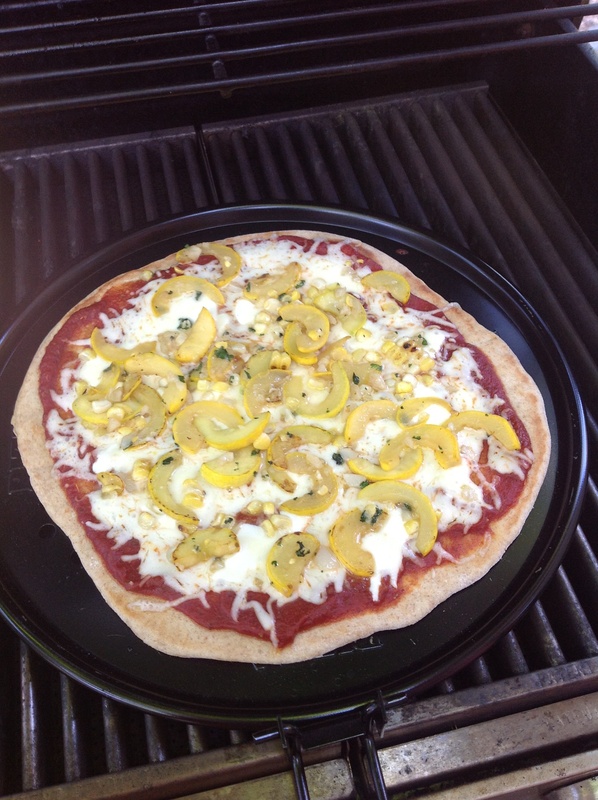 Overall, my Healthy Italian pizza recipe made for another delicious summer pizza! The third pizza created while I was in Indiana was a true collaboration. 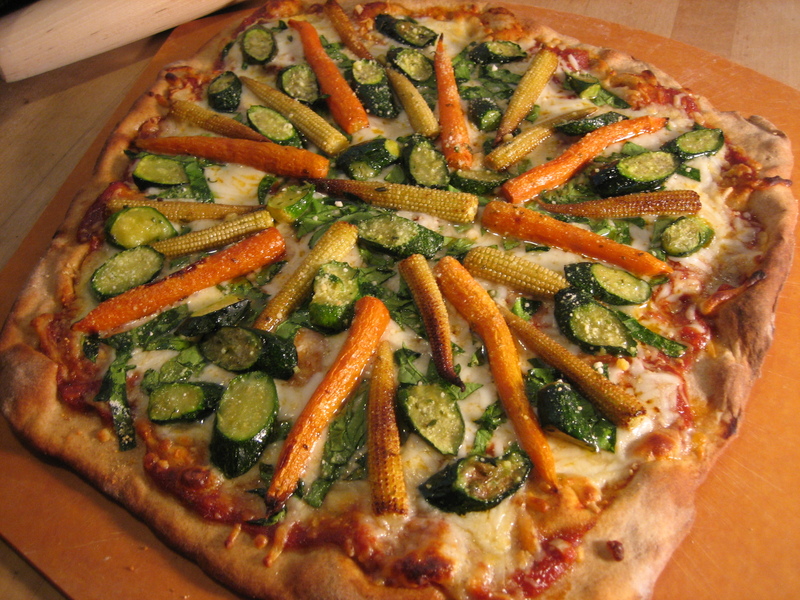 I suggested creating a pizza using zucchini picked from Uncle Al’s garden. Uncle Al decided we should include roasted garlic. We mashed it up with some olive oil before spreading it on the dough. My cousin Dawn had the brilliant idea to add caramelized onions. I have attempted caramelized onions in the past but haven’t had the patience to let them caramelize. Uncle Al taught me the proper technique and they turned out beautiful. My Aunt Dianna suggested using sliced parmesan cheese. On top of the cheese we added the sliced zucchini and the caramelized onions. This pizza looked beautiful before we baked it, and smelled mouthwatering when we removed it from the oven. The flavors of this pizza married so well together. 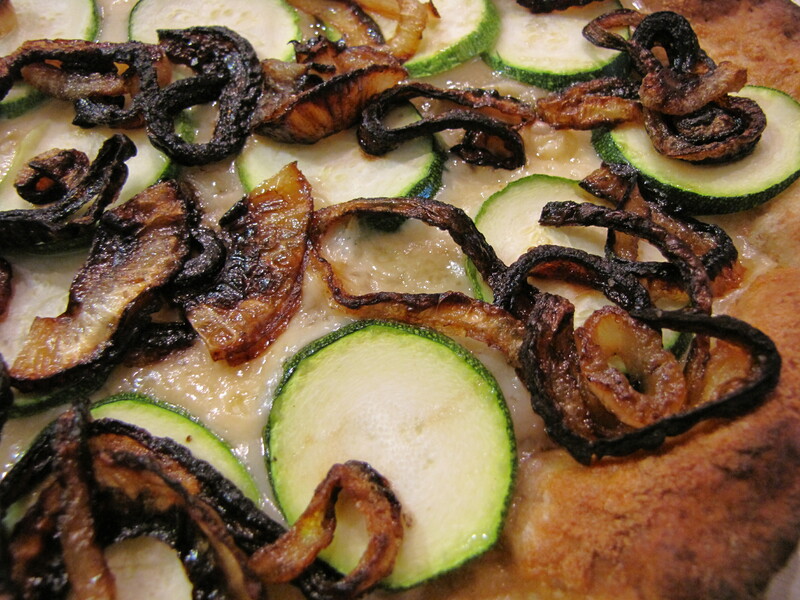 The sweetness from the caramelized onions, roasted garlic and fresh zucchini tasted amazing with the rich, sharp flavor of the parmesan cheese. I look forward to using caramelized onions in some of my future pizza creations. I have started to make more than one pizza when we have company so in addition to the Cheeseburger pizza I prepared the Horseradish Squash pizza. While picking up pickles for the Cheeseburger pizza we found a jar of garlic horseradish spread that was calling our names. I spread that on the dough, topped it with mozzarella and Fontina cheeses and some sliced summer squash. The sweet and spicy aroma from this pizza quickly filled the kitchen and stoked our hunger. While eating this pizza, the spice from the horseradish caught me off guard on a couple of bites, but I kept going back for more because it tasted so great! One of my favorite summer vegetables is summer squash. I usually sauté the squash with onions and garlic, then toss it with pasta or grate it to make zucchini patties. 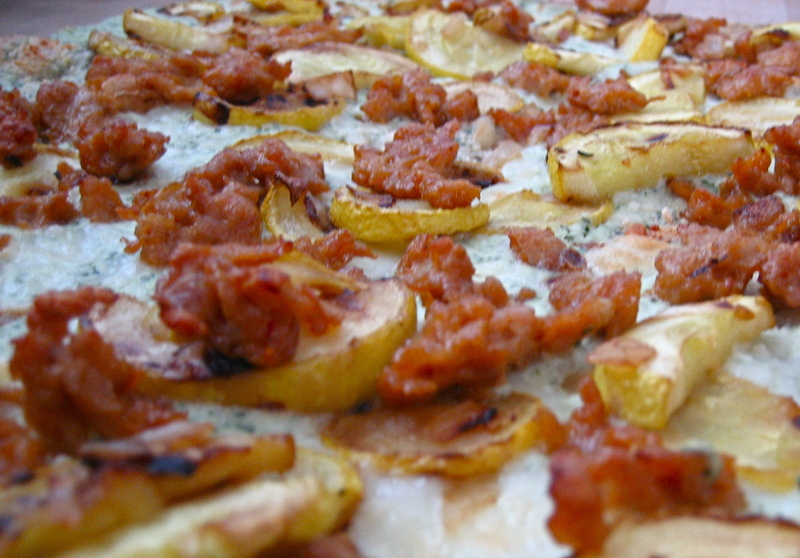 Squash has also been a favorite topping of mine for pizza. 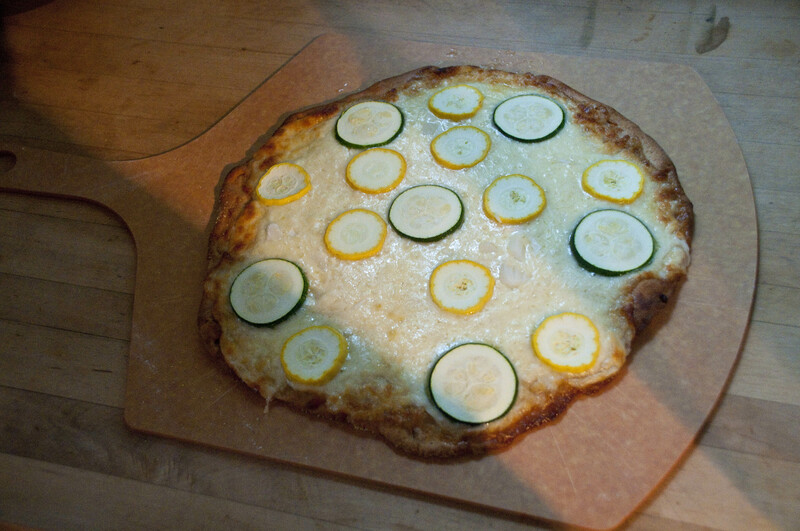 This past week summer squash and green garlic were two of the items we got from The Good Food Collective, so we had an easy decision for pizza this week. Like with the pasta, I sautéed the squash with garlic and onions to top the sauce and mozzarella cheese. 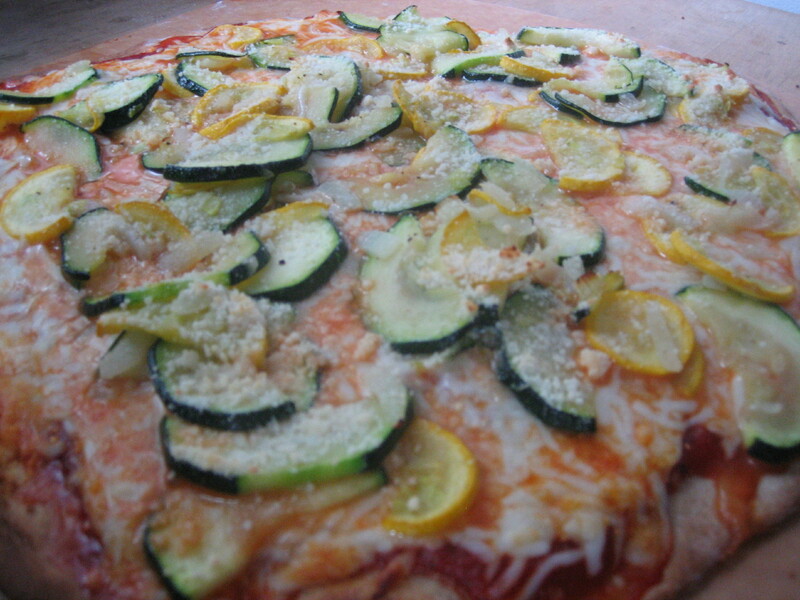 This is an excellent pizza recipe and a great pizza to make for my friend Nicole, who is also a summer squash lover. This is turning out to be a fantastic summer filled with great friends and great pizza!